Notwithstanding the devastating fire of a year ago, BAC is once again in full flow. Indeed, perhaps, they never stopped. Clout Theatre’s Feast, BAC, Feb 2016. An evening spent seeing two shows is like being tilted back into the 1980s – the venue bursting at the seams with young audiences, with work that breaks convention at every turn. BAC’s proud boast is that they are making theatre of the future. Ironically, Clout’s Feast (a previous show, The Various Lives of Infinite Nullity gets another airing at the Vault Festival from Feb 17-21) reminds me more of the radical, often very controversial companies brought by Lucy Neal and Rose Fenton in LIFT, their international festival of theatre in the ‘80s and ‘90s. 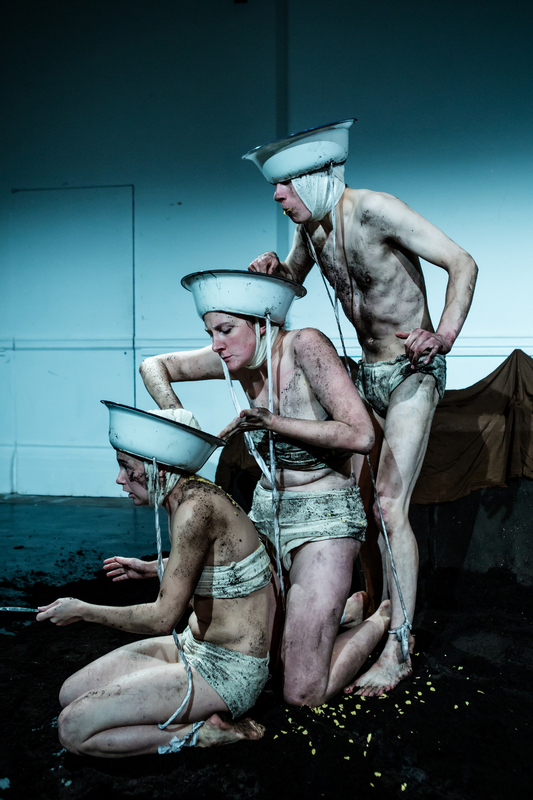 Meeting during their training at Lecoq in Paris in 2012, Clout’s aesthetic seems to derive from what Grotowski or Artaud might have called `poor’ theatre. Clad only in rough bandages, faces covered for anonymity and with a stage set of earth and large table swathed in black dustbin liners, first impressions are of runaways from bedlam or escapees from the Marat Sade. And so it continues. Feast is at once shocking, tremulous and disturbing, Cloud’s examination of our relationship to food filtered through an absurdism designed to provoke. Bodies writhe – the beginning of life perhaps. Underneath the bin liners, the table is revealed as a groaning banquet; a vast platter of spaghetti, bowls of brown and white dessert, red tomatoes, melon, green leaf. Later, the vagabond attire gives way to satirically dressed pierrots, in frilled sheets topped by porcelain collars. Just as well, since in what follows they become spittoons for discarded food. An unspeakable fate awaits a tomato; so too raw steak, the melon and finally the coup de theatre which takes us on via video-cam trip, not down memory lane, but the throat of the scantily clad male cast member, Charles Adrian Gillott. Performed, as you might expect, with sly humour, Clout’s intention, I suspect, is to make a connection between the masochism they inflict on themselves and what we perpetrate on ourselves and those in the food production chain. Not exactly a feast for sore eyes or sensitive stomachs, but definitely one for Live Art aficionados. Feast runs at BAC to Feb 6, 2016.
Review first published in Reviewsgate, Feb 2016 and slightly amended here. This entry was posted in 2016, Reviews and tagged absurdism, Artaud, BAC, Clout, Food and violence, grotesquerie, Grotowski, Lecoq on February 5, 2016 by Carole Woddis.